My photo prints for this year’s Show arrived this morning. I am letting them linger, unopened. It’s exciting but it is also a little scary. What if they look awful. What if I chose wrongly and they don’t show up well as a print. What if they made as big a mess of them as the shop did last year. Oh, my. I certainly am scared to look! Will we even have a Show? East Mainland and Shapinsay have cancelled their main events, as they expect their grounds to be unsuitable. Fingers crossed for Sanday, please. 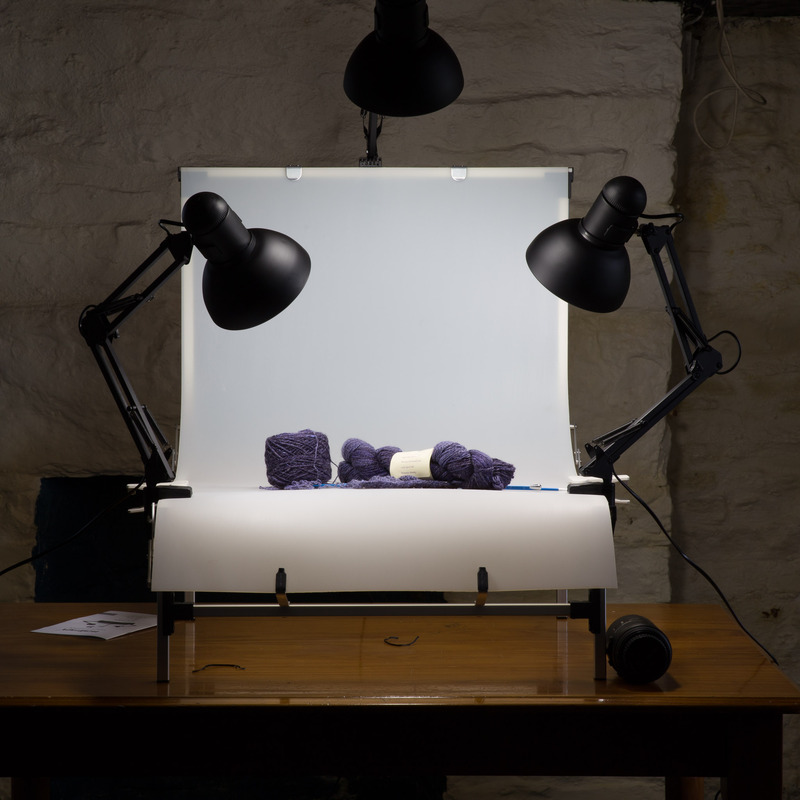 As the adapter plugs for my new studio lights arrived yesterday, last evening saw me experimenting with the kit. I clearly have much to learn about lighting and I shall be looking for instructional material today. I was so excited… nay, thrilled, to see the last of one roving spun up into singles. There was a time when I never truly believed that this project would come to an end. It turns out that not only will it be finished but the actual job itself is not all that lengthy. The secret, or so it seems, is to actually make time to sit down and spin. Oh, yes. I am the Keeper of the Knowledge. Well, now that I have my little studio caravan, I hope to make lots of time for spinning. It is so much easier when I don’t have to find the space as well as the time. Now I can go outside, turn on my music and sit straight down to spin. It’s pretty damn wonderful. There may be a hiccough later in the year as I don’t have heat and light connected yet. Fair enough, the jobs in the house have to come first, I know. Buoyed up as I have been about the spinning, I decided to review the Schedule and my WiP bags to see what might be turned out by the end of this month. I selected one of Hunter’s Curls. It was not much of a WiP and I had only effected 10 rows, at the short end. I did two more, very slowly indeed and with a degree of backwards knitting. Could I really knit this Filemot and block it by the end of this month… I admitted that the answer must be no and then took the decision to knit a simpler Curl, the Argent and I cast it on yesterday afternoon. I have already knitted two repeats and things are going well. Whether or no I can meet the deadline, I have no idea. 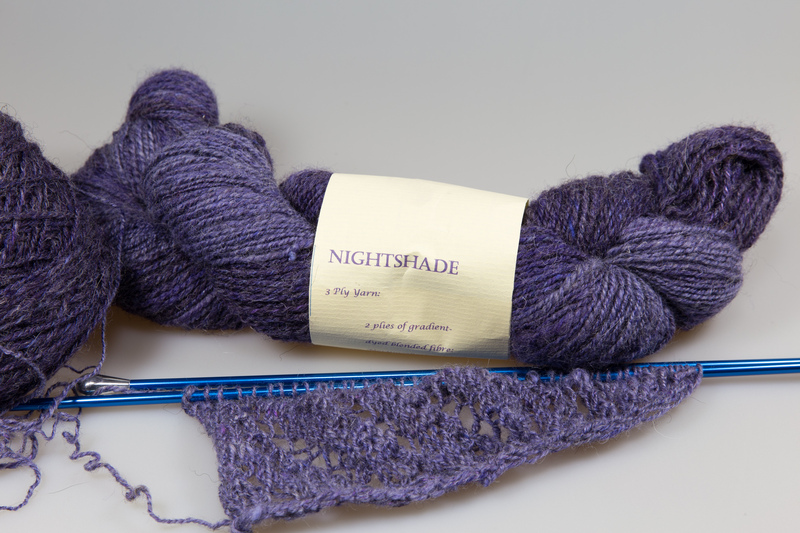 I will not be cutting it short in order to dress it for the Show as I am using my precious handspun and intend to get the most from it. On reflection I feel that this was the right move. A simpler pattern will show off the handspun better and any glitches present in my handspun yarn might well take away from the wonderful stitch pattern in Filemot. Filemot will come later and most likely in a commercially spun yarn. I seized the opportunity to photograph the new project on my new product stage and I am very pleased with how good the colour reproduction is. It could be bettered, but it’s not too bad at all. Today I need to spin a bobbin of singles, knit some Argent, label my Show prints and provide Mr L with a timely lunch as he has a meeting at 1:30 pm. I have no idea what to feed him. It is a Fast Day today. We took a week off from the fasting back in February and have failed to return to the 5:2 model until this week. Weight has been gained. We had attempts to fast over the weeks on days when we would agree to do it. I cooked suitable lunches but at tea time we both said we did no want to fast… not really. It is odd but this week it feels good and natural and we are both happy to do it right. The time must be right. I hope that we maintain it for the foreseeable future. The lesson is learned however – taking a short break is not a good idea and does not work for us. Next Post Who stole my title?